Speak with one of our Account Managers about your specific booth requirements. As experienced exhibit professionals they can review your options and present you with customised solutions for your shows. As a full service exhibit builder based just outside of Toronto in Brampton, Ontario, we have over 25 years of experience working in major event venues in the Greater Toronto Area (GTA), across Canada, and the U.S. Whether your show is at the Metro Toronto Convention Centre, or at McCormick Place in Chicago, we work closely with you to craft your display locally; we coordinate your show services, rental furniture, labour, as well as, manage logistics to ensure you look your best at the event. You can save where it counts: compared to the investment in an exhibit booth purchase, a lower upfront investment in a rental exhibit won’t tax your marketing budget. You only rent the components you need, which frees up funds for additional initiatives. A change in booth size, 'look & feel' refreshes or a complete redesign, with a rental exhibit display system you can easily update your look from show to show. Our rental program is adaptable and flexible allowing you to expand, contract or reshape your exhibit as each show demands. Our rental exhibit booths are a combination of the modular German exhibit system 'Octanorm' and custom components. Each piece of the rental structure is thoroughly checked before and after every show, and shipped in special crates to keep the exhibit materials in top condition. We integrate custom components such as, fine millwork, unique exhibit lighting design, fabric graphics, dimensional graphics, innovative print solutions and other quality materials, to ensure your booth speaks to your brand and gives your attendees the experience you envision. By working with a local, experienced, and design focused exhibit display company to build your rental booth, you do not have to compromise. Don't choose from a shell scheme package. Whether you are looking for a 10' x 20', 20' x 20', 20' x 30' booth or larger, speak with one of our Account Managers to review your specific booth requirements, discuss your rental options and stand out from your competition. Is a rental exhibit right for you? Do you exhibit only once or twice a year? Do you require different exhibition booth sizes at different shows? 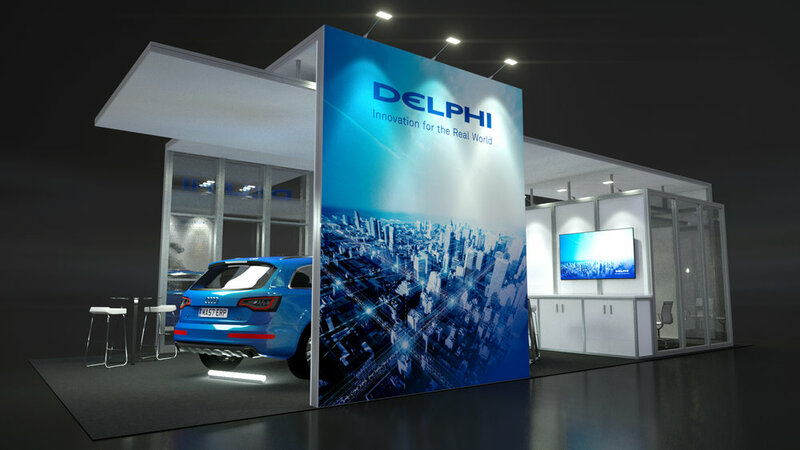 Is it important for your company to update the look of your exhibition display on a regular basis? Do you have multiple trade shows that take place simultaneously? Are you new to exhibiting and want to give it a try? Are the large investment costs for a purchase holding you back from exhibiting? If you answered ‘yes’ to any of the questions, please get in touch with one of our Account Managers at 1 (905) 799.8950 x 1 or sales@exhibit-solutions.com to find out more about our exhibit rental program. Speak with an Account Manager about renting a booth that is custom designed to meet your needs. Please provide a phone number if you would like us to call you back. Yes, please send me updates, industry news or special offers. We will reply to your message within one business day. If your enquiry is urgent please call us at 1.905.799.8950.